No Smoker? Gas Grill Smoking Will Solve Your Problems! You can create great tasting smoked food by gas grill smoking! You don't need to buy a new meat smoker in order to enjoy home-smoked foods. Put your gas grill to work…it'll do just fine! The secrets of gas grill smoking are indirect heat and temperature control. In order to smoke successfully, your grill needs to have at least two burners. It also should have a temperature gauge. Here's the low-down on what you'll need. A temperature gauge mounted in the lid…preferably marked in degrees. If your grill doesn't have one, pick one up at any store that sells grill parts. Installation directions should come with the gauge. It's important that you know what the temperature is inside the grill. Locate the gauge front and center in the cover, a few inches above the level of the grates. If your grill has cast iron grates, it's important that they are seasoned correctly. This will help prevent the foods from sticking as they smoke, and prevent rust from forming. After cleaning the cast iron grate, coat all sides with vegetable oil, and heat them over low heat in the grill for 30 minutes. Brush on another coat of oil before each grilling session. Ideally, your grill will be able to maintain a constant temperature of 225 degrees Fahrenheit. Anything up to 250 degrees will be OK for smoking, but it's best if around 225. Test your grill before you use it to smoke food. Light one burner and set it on high until the temperature reaches 250 degrees. Turn the burner to low. After a half-hour, check the temperature. If it's under 225, crank the burner up a bit and wait. Keep adjusting the flame until the grill reaches and maintains 225 degrees. 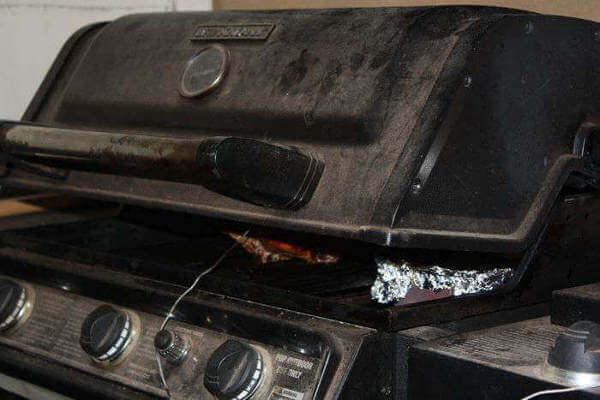 If your grill runs over 250 degrees when it's set on low, you can try propping the cover open a bit. 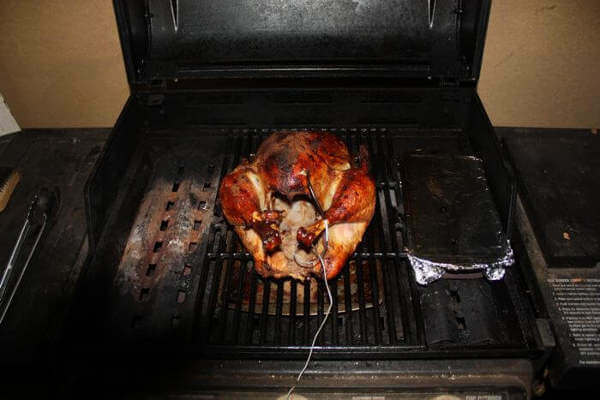 Poultry smokes well at higher temperatures, too. Try smoking your next chicken or turkey at 325 degrees Fahrenheit and you'll see what I mean. Protect the wing tips and legs with foil to prevent burning. Every grill is different, and you'll need to experiment to find the magic setting for yours. The temperature inside the grill will be affected by the outdoor temperature and wind, as well. Be prepared to make "weather adjustments". Using heavy duty aluminum foil, wrap wood chips or chunks into packages, each about the size of a tennis ball. There's no need to soak the wood first when wrapping it in foil. You can poke a hole in the foil to release smoke, but that's not necessary either. When the wood begins to smoke, it'll find a way out. Place the wood packages directly over the burner you'll be using, positioned under the grate and directly on top of the lava rocks or the metal shield. Turn the burner on and set it to medium or medium-high. You'll need to experiment in order to determine where to start with your grill. When you see your gas grill smoking, place the food on the grate, opposite the smoking wood, and close the cover. Maintain the temperature at 225 to 250 degrees until the food is done.